TUSC, co-founded by the late Bob Crow in 2010, was the sixth-biggest party on the ballot paper in May 2015, with its general election and council candidates polling 118,125 votes. This time, however, TUSC will be working all out to try and get Jeremy Corbyn into Number Ten on June 8th. 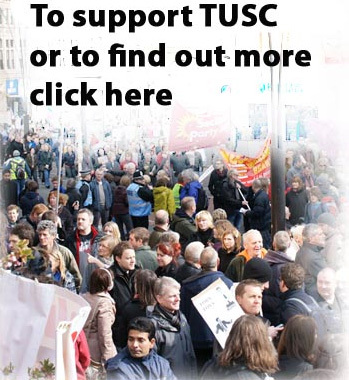 "This has meant that TUSC has been prepared to contest local elections against right-wing Labour councillors carrying out Tory cuts. No politician from whatever party should expect that they can carry through austerity policies without challenge at the ballot box. "But this general election is different, giving working class people the opportunity to drive out the Tory government and, on this occasion, put a socialist in Number Ten. That's the job that we will concentrate on for the next four weeks. "We know that getting 326 or more Labour MPs elected on June 8th wouldn't stop the Blairites continuing to plot against Jeremy. They did it last summer and, if they feel confident enough, they could do it again this summer. They don't support the socialist policies of taxing the rich and public ownership that are needed to overturn the 'rigged system' and they will do what they can to resist them. "But defeating the Tory government would be seen as such a victory for Jeremy Corbyn it would inspire and give confidence to millions that a different society is possible. "It would create the chance to build the mass support base that Jeremy will need against the capitalist establishment to implement his policies and we will work determinedly towards that end". "Our union's policy is clear. We want a Corbyn-led Labour government carrying out policies of support for trade union and employment rights, the repeal of anti-union legislation, public ownership of the railways, and opposition to austerity, and in this election we need the maximum number of Labour MPs returned to have the chance to achieve that". Dave Nellist concluded: "We are entering a period which will potentially throw all 'established political facts' into question. We shouldn't forget that if just 1,600 people had voted differently in 2015 the Tories would not have had an overall majority. The election outcome is not a foregone conclusion. "Nor should we forget that last summer's vote to leave the EU was also a protest by many working class people against the establishment, unanticipated by 'political experts' and the media. TUSC campaigned for a leave vote and one of our contributions to the general election campaign will be to argue the case for a socialist Brexit that puts workers' interests above those of big business and city bankers. "But the new fluidity of British politics also includes the question of whether Jeremy Corbyn will remain unchallenged as leader of the Labour Party after June 8th - even if the Tories are defeated - and what that would mean for working class political representation and TUSC's role. "So TUSC will be fighting in the next few weeks for a Jeremy Corbyn-led government with socialist policies but also preparing for the new political situation that will present itself after June 8th".